Just having a bit of a think about the educational side of things today – taking stock of what the girls have learned from their new “teachers” (us), and their new surroundings so far. So, on the up side, they have all got a new library card for the UK, and they have all borrowed books. I chose some of them, and those are the ones that remain unopened, but I feel sure that they will be hugely educational when they do actually decide to open them, so it’s all good. Those, I would consider to be the most directly educational things we’ve done to date, but naturally, there has been lots of learning happening in between. Some of it is perhaps of a questionable nature, but all learning is good, right? Let’s start with what the youngest one managed to sort out today: breakfast is breakfast, dinner is lunch, tea is supper, and supper is bedtime snack. Done. Very confusing for the past two weeks apparently, but now fully understood. She has also learned from her super-shopper auntie’s expert tuition that Primark is the best place to buy shoes, because it won’t take up all of your pounds, and you may even be able to buy two pairs and still have money left for ice-cream. Speaking of ice-cream, we have all learned that hearing the sound of an ice-cream man from a distance, and then not having one come up your street is a tragedy of epic proportions and can ruin your entire day. And still in keeping with that theme, our middle daughter has learned that a person can eat a lot more chocolate, ice-cream, cakes, and sweets (aka candy) before actually throwing up than she ever thought possible. Mmm, not sure I can find a positive spin there…moving on! Our oldest daughter has been very busy making up a fabulous game based on “3 movies, 5 books, and a previously invented game” with her cousin. They are full of imagination and adventure, and are absolute kindred spirits, so lots of learning there, I’m sure. The biggest and most disturbing learning for me happened while we were at the caravan. As all Brits will no doubt be aware, there are things called “amusements” at seaside resorts, caravan parks, etc. I would argue – in a court of law if necessary – that these establishments are very poorly named indeed. They are not one bit amusing. Well, that’s a lie, because I used to find them marginally amusing before I let my child with a slightly obsessive/addictive personality go there. I have to tell you, if you have one of these children, and they are previously unfamiliar with “amusements”, DO NOT GO IN. Because when you put your 30p in, the teddy does not come out. And all your 2p’s actually disappear into oblivion instead of pushing out more 2p’s and the plastic car. And, if you could just have ONE MORE TURN, you would be able to get that monkey into the claw and you would be a WINNER!! No, not amusing. Not amusing at all. 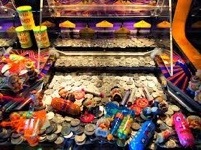 A child’s introduction to gambling hell. I’m sure there’s a lesson in there somewhere, but until we figure it out, we need to just step away from the amusements. Keri – A Roadschooling mom of 2 lil explorers!